'Proptech' harnesses digital tech to change the way we buy, sell and think about property. A drone the size of one's palm buzzes 50 metres up a skyscraper in downtown Singapore. Tracing the contours of the building, the machine scans for cracks and records the temperature of the building’s façade as it makes its ascent. Sitting in a room 5 kilometres away, a man sees a live feed from the drone's camera on his desktop screen. He analyses the data and combines it with information collected from hundreds of other buildings. Welcome to proptech 3.0 – the convergence of property and technology – where autonomous drones, big data and artificial intelligence (AI) come together to transform the property sector. I’ve been in real estate my entire career - and it is clear to me that much is changing, and changing fast. For instance, instead of sending property managers out to buildings to manually inspect them and log the findings, the job can now be done by smart robots capable of carrying out each task with lightning precision. People can then focus on higher order tasks instead. They analyse the data, pre-empting any maintenance requirements and planning ahead, saving millions of dollars in cost for their organisations. While proptech is more established in Europe and North America, Asia is set to drive much of the industry’s innovation and adoption. 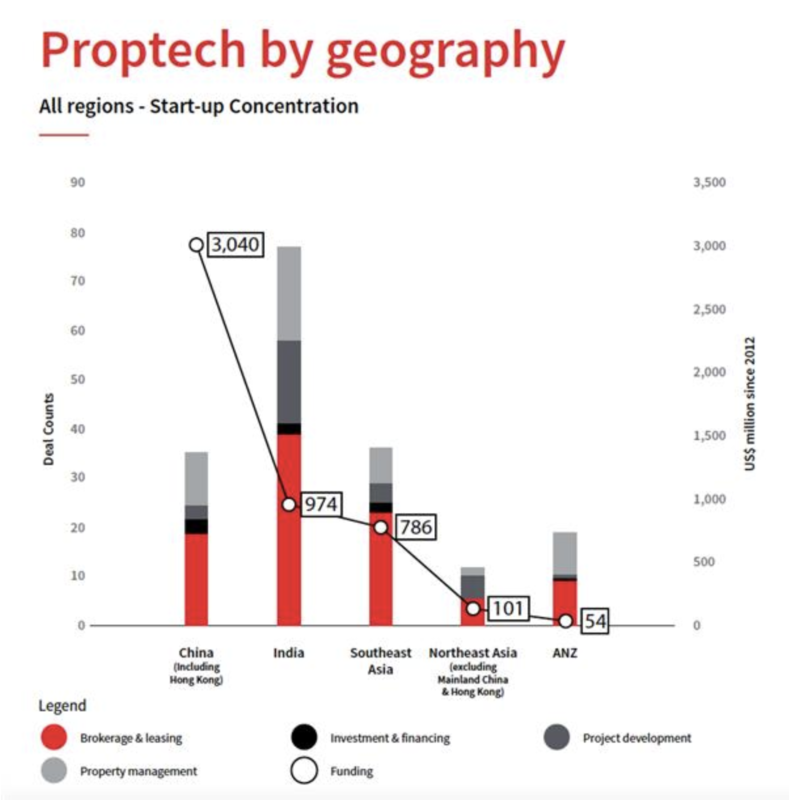 Looking at the big emerging markets, India tops the list in the number of proptech start-ups that have received funding; China, though it has fewer proptech start-ups, has drawn around 60% of the funding in Asia Pacific since 2013. In Singapore, the government has adopted the use of new city planning technology through its Smart Nation programme. For instance, Singapore’s National Research Foundation launched Virtual Singapore, which will map the entire city in a virtual 3D model. The S$73 million project will enable the private sector to test new solutions, including building tech and management. Second, the impact of technology on the real estate marketplace will be tremendous. Until now, it has been characterised by asymmetric information, with sellers at an advantage over investors and buyers. Proptech is changing all of that. Using big data, property watchers and investors are also able to get accurate predictions of real estate trends and market movements. In Singapore, one company has derived a formula to calculate the value of a property using a mix of comparative market analysis and algorithms, instead of through manual valuation. Virtual reality is also enabling buyers to scan properties before they step though the door. Similarly, blockchain technology, a game-changer in transactions, has the potential to make buying a house online via ‘smart contracts’ a reality. This would effectively eliminate paper contracts and simplify the conveyancing process, saving thousands of dollars in the process. Third, technology will dramatically alter the way we use our buildings. In many parts of Asia, homes are no longer just brick and mortar buildings in which to house people. With smart technology and the internet of things (IoT), a home’s occupants are able to do everything from monitor their babies to manage their appliances. For instance, Indian tech company Digital Gorkha helps secure homes and manage visitors through an app - which means owners no longer need to be around to receive visitors such as repair engineers or contractors. New technology has even enabled homes to become energy producers. In China, start-ups such as Seeder are adding solar panels to buildings in Beijing, cutting carbon emissions in a city known for its air pollution. Some of this energy can be resold back to the grid. But we are really only seeing the start of the proptech 3.0 wave. Emerging technologies such as 3D printing and cryptocurrencies are poised to make further inroads into real estate. Not too far in the future, entire buildings could be 3D printed. Singapore’s Nanyang Technological University is studying how to use giant 3D printers to print entire levels of a high-rise building, while China’s WinSun already claims to have printed a five-storey building with decorative elements on the inside. These are just some examples of how we are already seeing technology reshape the real estate industry. What is clear is that things are going to change, and change rapidly. Indeed, as Asia continues to develop, I am sure that proptech will be a key driver in the physical transformation of cities across the region and will set the foundations for a new era in real estate.